Ultimate Guide to PA Car Accident Cases | Purchase, George & Murphey, P.C. Were you involved in a car accident on a road or highway in Pennsylvania? You should read this book BEFORE you talk to an insurance adjustor and BEFORE you talk to a lawyer! If an insurance adjustor is calling you and wants you to sign just a few forms, or just wants to talk to you on the phone because he’s concerned about you, you definitely need this book now. The One Auto Insurance Option That Can Cost You Tens of Thousands of Dollars! 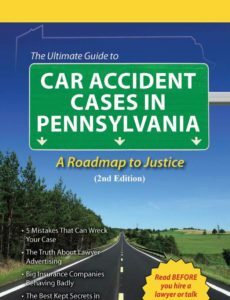 You may have a copy of this book for free if you’ve been in an accident and need help, you may have a free copy if someone you care about has been in an accident and needs information, and you may have a free copy if you’re just curious about Pennsylvania insurance, car accidents, and personal injury claims. However, if you’re a lawyer who’d just like to copy our book, please write your own. You’ll be better for it. And if you’re an insurance adjustor or defense lawyer, please disclose that to us. Disclaimer: This book is not meant as legal advice. It is helpful information for people who’ve been in car accidents and for people who are interested in auto insurance. However, legal advice can come only in the context of an attorney-client relationship. No attorney-client relationship is formed by ordering this book or by the receipt of the book. We enter into an attorney-client relationship only through documents that are signed by both the client and a Purchase, George & Murphey, P.C. attorney, with those documents specifically creating an attorney/client relationship. Also, we reserve the right to review and decline requests for our book.